Yesterday Bloomberg ran a qualitative story on how much capital U.S. banks need. The story mentions some percentages, and then settles for a leverage ratio of 20%. However, the author of the article, James Greiff, offers no numerical support for the 20%. So, here are some numbers. 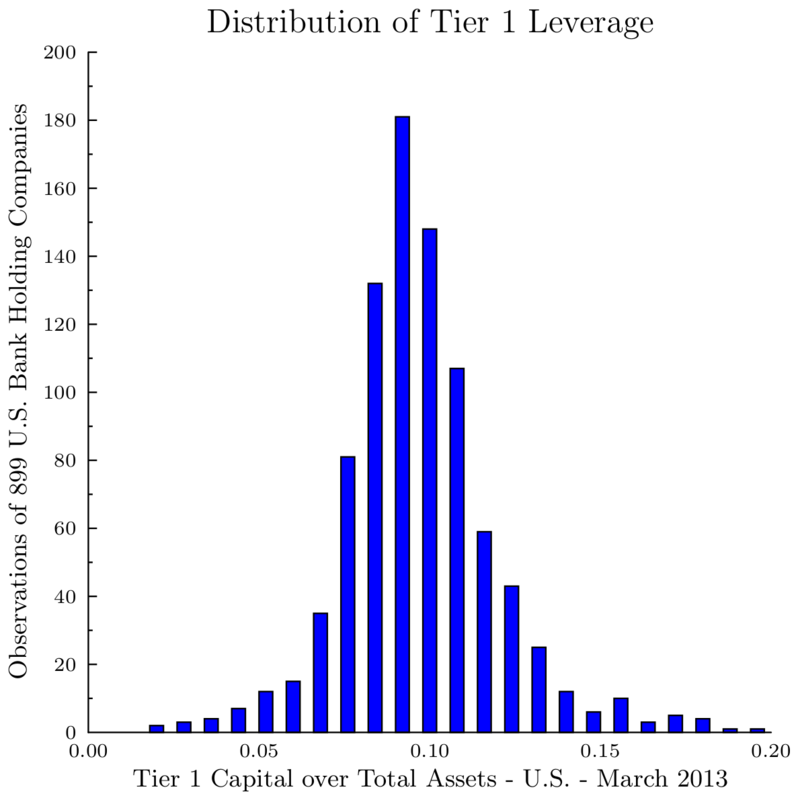 Using data from U.S. Bank Holding Companies, I calculated 1) the distribution of Leverage, and 2) the shortfall of Tier 1 capital for U.S. banks. Both for end of March 2013. The distribution shows that moving to a 20% ratio will be difficult, though not impossible, as almost all banks report a ratio below 15%. 10% would be a proper first step. The table below shows the impact. For example, moving to 3% should be easy as only 5 (!) banks in my sample do not meet that ratio. It requires a mere $38M to replenish capital to get to 3%. The bank that needs the most capital to get to 3% needs only $18. Moving to 10% requires more efforts and capital: about half of my sample-banks need capital. However, and this is important: the required amount is not at all absurd: $274B. This is about one third of the amount authorised for TARP ($700M). The 20% looks a bit like a stretch for now: it requires forking out an amount of $1.6T. As with many ratios, 10% tends to be a fair number, that is, for now – and please keep in mind that the amounts and inferences above are all based on the current data, ignoring any dynamic adjustments (thanks Professor Admati for pointing this out). (Note, I used a conservative Leverage ratio, one that divides Tier 1 capital by Total Assets; indeed I did not use the less conservative Risk Weighted Assets. Further, I used data from banks with a current Tier 1 Capital ratio over 3%, to exclude banks that are significantly uncapitalised, these are on the intensive care anyway. I ignore Tier 2 capital, as that part of capital is driven mainly by provisions, i.e. expected losses. Graphs are made with GLE the Graphics Layout Engine). Previous Post Leverage Capital Ratios vs Risk-Based Capital Ratios of U.S. Banks, a graph.